It is reported that over 2% of £1 coins in the UK are counterfeit. A man was convicting of manufacturing millions of coins in 2007 and there have been other convictions since then. However, £1 coins remain in circulation for many years and it is not inconceivable that one may be in your pocket. How can you check? Here are a few pointers to the forgeries – you can use a simple magnifier or a stereomicroscope to observe them. A genuine coin (left) is compared to a counterfeit one (right). 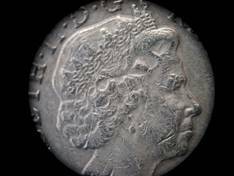 Look at the definition in the Queen’s head – a counterfeit produced by moulding and original coin, producing a die and striking a new coin will probably show poor definition. Check the quality of the coins; usually produced by striking – impressing the pattern onto a metal blank. 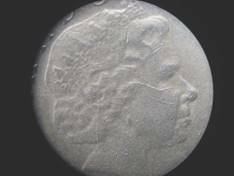 The detail round the face of the coin is poorly defined. The detail round the edges of the coin are different. The initials of the designer are missing. This fine lettering is difficult to reproduce in a mould of an original coin. So there is plenty of evidence to suggest that the coin on the right is counterfeit. Of course now it has been recognised I shouldn’t pass it on when buying anything! 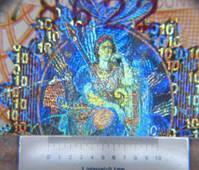 See the Royal Mint website for more information on Counterfeit One Pound Coins. Currency notes have lots of features incorporated into them to stop them being copied. You can see some of them easily with a magnifying glass. The hologram on this side of the note is difficult to reproduce. It looks good when viewed with a microscope. 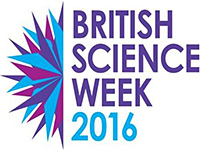 It is only 1 cm across but look at the detail in it when the Britannia image is visible. On the both sides of the note there is microprinting. It is easy to read with a magnifier. 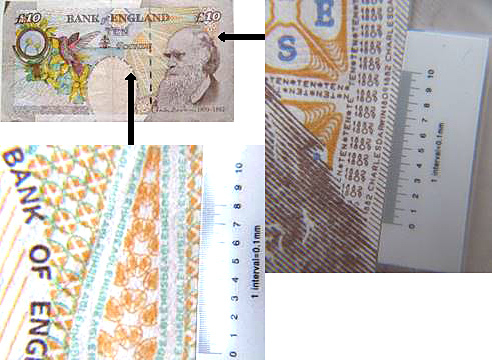 See more about the security devices on British notes at £10 Note (Charles Darwin) – Security Features and Take a Closer Look.